Several countries are considering web-based voting as an alternative to, or a replacement of, traditional voting methods. It is argued that electronic voting could increase voter participation and help strengthen democracy, as e-voting would increase accessibility for large sections of the population, particularly with regard to groups that previously have experienced difficulties with the traditional voting setup. 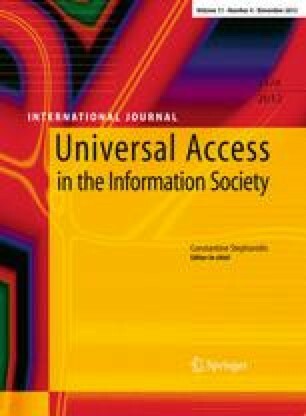 With a focus on usability and accessibility, this paper reports on a study evaluating several electronic voting prototypes in Norway, involving technical aspects as well as expert evaluation and user testing in the field, with users from a wide range of disabled user groups participating in the study. Technical testing regarding accessibility standard compliance, testing with the personas method and user testing revealed that many rather basic universal design principles were either not fully understood or not prioritized for implementation by the solution providers. However, despite various accessibility difficulties, the participants generally showed a positive attitude towards web-based elections. Through the findings of this study, the authors highlight factors that are important to consider in the development and testing of web-based voting systems. Parts of this work were presented at the Unitech2010 conference, see Halbach et al. .
We want to thank the E-vote 2011 project for our engagement in this evaluation of the usability and accessibility of the prototypes under consideration. We also acknowledge the help of the user organizations in order to recruit participants for user testing. Our gratitude also goes to the testing participants who provided us with valuable insight. Special thanks to our co-workers and colleagues in the project, Ivar Solheim, Øystein Dale and Trenton Schultz. This paper is partly funded by the Norwegian Research Council, mostly through the e-Me project. Finally, we thank the anonymous reviewers for valuable comments and suggestions, which helped us in improving the paper.